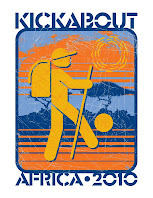 Boston, MA - Sport in Society, a recognized leader in the international sport for development community, has pledged their support for Kickabout: Africa 2010. "Kickabout is an innovative and inspiring initiative and journey to create awareness, energy, and a legacy of sport for development and peace within communities throughout Africa. Sport in Society is delighted to show our support, and to serve as a resource for the Kickabout team,” says Eli Wolff, Sport in Society Director of Strategic Partnerships. Through innovative programming, rigorous research and extensive outreach that impacts thousands both locally and worldwide, Sport in Society uses the power and appeal of sport to foster diversity, prevent violence, and improve the health of local and global communities. For Kickabout, Sport in Society will help arrange visits with universities and other local partners along our route from Cairo, Egypt to Cape Town, South Africa. Sport in Society will also help to promote Kickabout's experiences with local sport for development projects across Africa. Kickabout co-founder, Brian Gonzales, is delighted to have Sport in Society on board. "Sport in Society is a tremendous advocate for sport and social change. Their large network of contacts, from prestigious universities to experienced practitioners and scholars, is an invaluable resource to us. We hope that this will help us achieve our primary mission: to raise awareness and support for the programs we visit on Kickabout." Click here to learn more about Sport in Society. 2 comments: on "Sport in Society supports Kickabout"